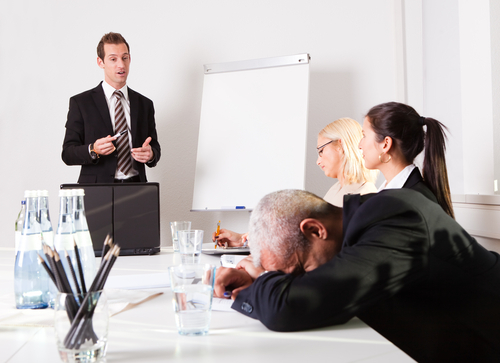 Are Your Listing Presentations Putting Them to Sleep? June is my designated ‘Trainer Appreciation Month’. So, I’m featuring blogs about training to help you sharpen your skills and enjoy your listing and buyer presentations much more. Are your listings knocking their socks off–or boring them to tears? You want to keep their interest! Help is here. Organize your listing and buyer presentations with the three steps here, and watch your listings and buyer clients go way up. We’re all presenters: Any time we’re in front of two or two thousand, our goal is to persuade the audience to our point of view. We’re presenters as agents when we do listing and buyer presentations. We’re presenters when we’re title insurance or mortgage reps, getting in front of people in sales meetings to persuade them to use our services. Unfortunately, most of the time, we just get in front of people and say whatever we think of first. That lack of attention to presentation organization leads to some big presentation mistakes, and costs us ‘sales’. Instead of stumbling through a presentation, why not organize it to grab their attention, persuade them to your way of thinking, and motivate them to action? In the middle of your presentation, add those stories, statistics, and visuals that support your point of view. By the way, as you create that presentation, jot down your point of view. 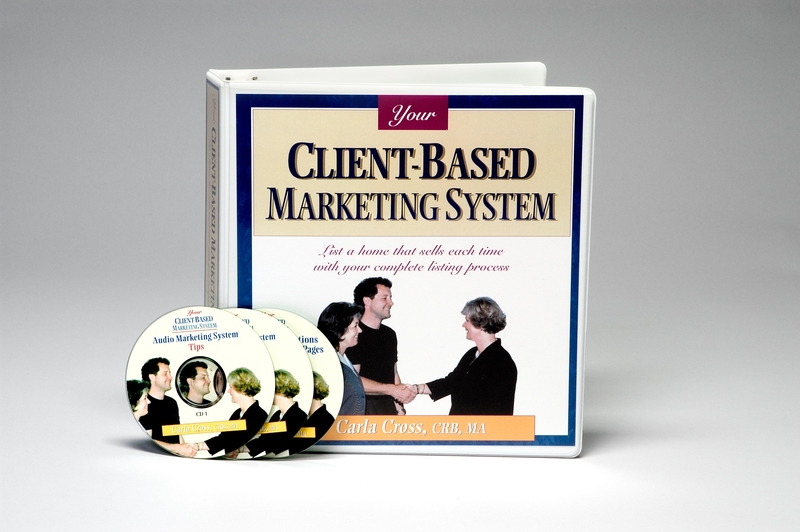 What do you want to persuade your potential clients to do? Now, you’re all set to craft a great listing or buyer presentation. And, since this is my Trainer Appreciation Month, I’m offering special pricing on my training resources. Check it out! I’d Like to Buy Your Buyer Process–You DO Have One? What if I came up to you and said, “I’d like to buy your buyer process.” Do you actually have one I could see, or, do you grab whatever is handy when you start that whole buyer interaction? It is amazing to me that agents wait so long to get organized! I remember, though, how confused I was as a new agent. I just didn’t know what to do first. Luckily, though, I quickly found buyers and started selling homes. 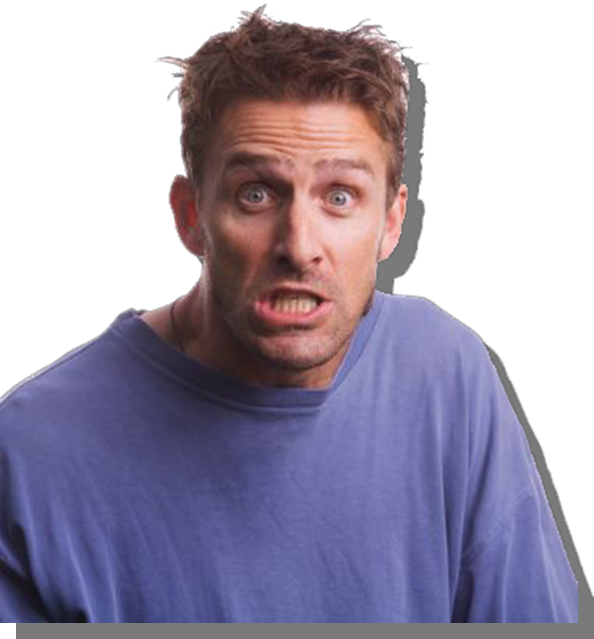 I’m going to tell you the bare truth: I was not organized, packaged, or, certainly—systematized! What I found, very quickly, was that I had to have ready-to-use systems to serve buyers and sellers as fast as I wanted to move (I sold 40 houses my first year in real estate!). 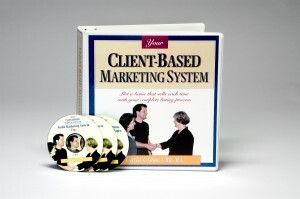 After years of working on them, I created packages for both buyers and sellers that work. Creating your Buyer System not only raises your value dramatically to buyers, it creates a track for you and your team to run on. When you treat buyers with the care and systematization you show sellers, your buyer close ratios go way up, and your time management challenges diminish. Why not start competing with very seasoned agents with your own packages? You will greatly increase your confidence, and find the buyer trust you much more quickly. 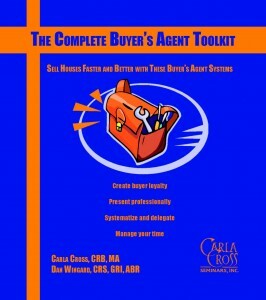 A resource to cut your ‘learning time’ down dramatically: Take a look at The Complete Buyer’s Agent Toolkit. You can see a sneak preview of the complete toolkit there, too. Make a goal for yourself to get your buyers’ process systematized now, and enjoy the benefits. How the Buyer Qualifies YOU…. Tip to the agent: Be sure your mission statement and promotional statements clarify your areas of expertise. Tip to the agent: If you haven’t sold at least 6 homes this year, be ready to show the buyer how you are honing your expertise to compete with more productive agents. Tip to the agent: If you haven’t worked in that area over a period of time, be sure to educate yourself so you’re working in the buyer’s best interests–and be able to explain that to a buyer. Tip to the agent: Be sure you’ve focused your efforts through creating a mission statement. Be able to explain to the buyer how you’ve made yourself an expert in the area they want to explore. 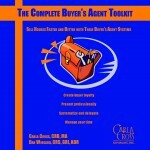 Tip to the agent: Create a detailed, professional buyer process. Have that process in writing to show the buyer, to prove you can lead the buyer through that process. My new business planning program, Beyond the Basics of Business Planning, helps you create answers to the questions above. 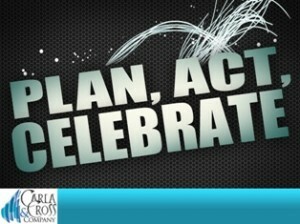 It guides you through the vision and mission process, and helps you set goals. See more here. Are You an ‘Agent-Centered’ or a ‘Client-Centered’ Salesperson? Are you ‘agent-centered’ or ‘client-centered’? 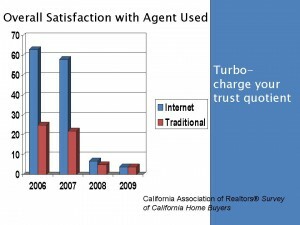 Client-centered means you keep the best interests of the seller or buyer in mind–first. An ‘agent-centric’ real estate salesperson is one who, for example, lists a property at any price–just to get the listing. That’s certainly short-term gain–but long-term pain. Here are five questions to ask yourself, to see which kind of process you use—and tips to change your process to true ‘client-centered’. This is from the seller perspective, but you can easily translate this, too, to the buyer perspective. If you’re like most agents, time management is your biggest challenge. No wonder. 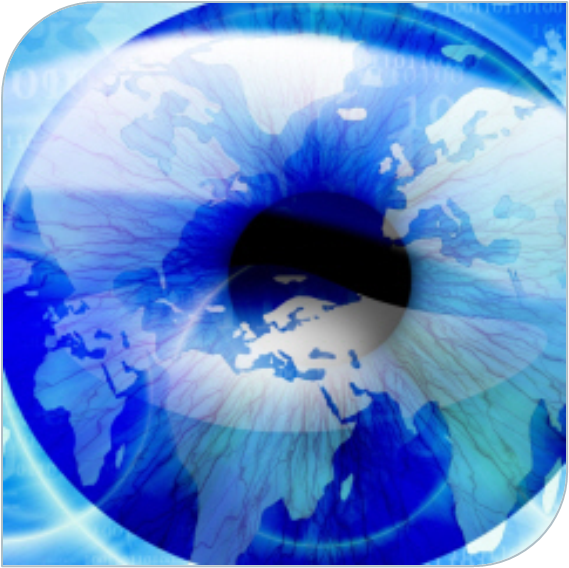 We’re dealing with people, not widgets…..Yet, we could work harder at organizing our ‘people systems’. That way, we could run a more predictable business–which is what clients want, by the way. Use my lists below to see how well you’re managing your time managerment. Start with one system or process at a time. Get a group of agents together, if possible. Make a list and prioritize it for the systems you believe you need first. Put a date to start, and a date for completion (I know, there’s that organization again!). You’ll find that the first is the hardest, and then, it starts to actually get easy! It’s a skill like anything else. 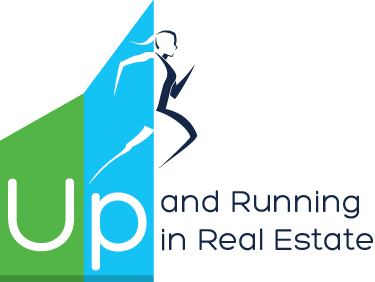 Bottom line: Systematization allows you to actually run a business, not just run after buyers and sellers. Are You the Buyer’s Best Choice? Are you the buyer’s best choice? 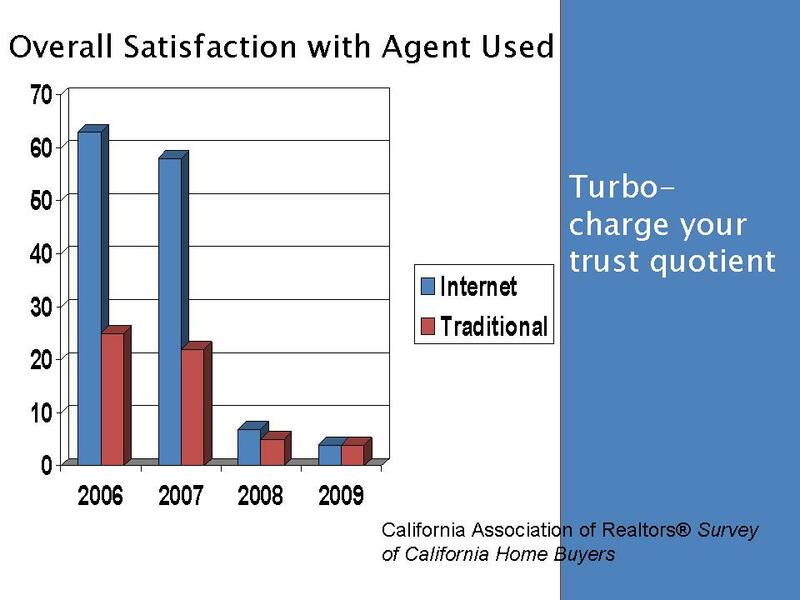 Some agents are still operating in the past, without the systems needed to provide that extra value to justify their commissions. 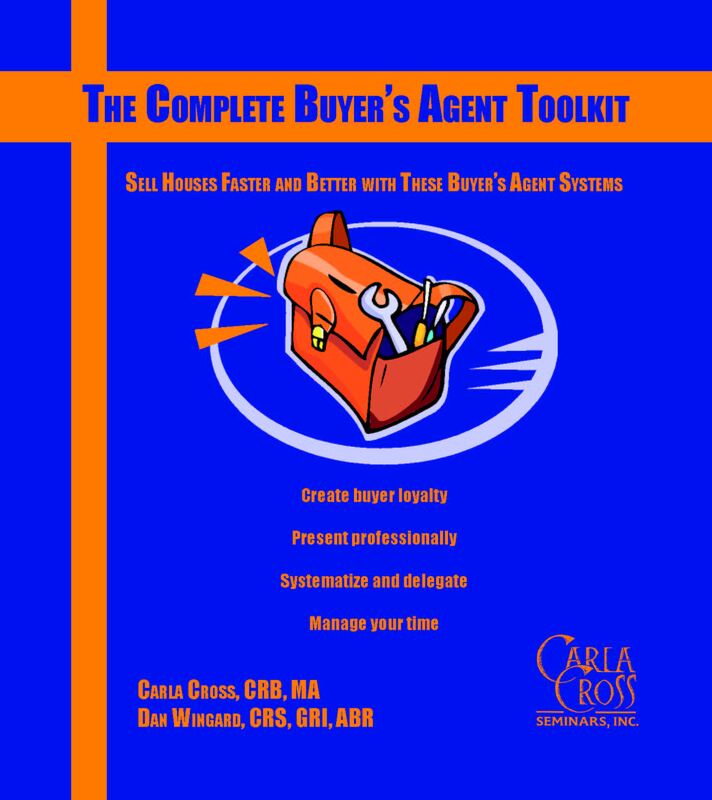 Creating your buyer systems provides visual proof to buyers that you are helping them prioritize the parts of the buying process where they need a professional’s expertise. In the next blog, we’ll talk about the other 2 parts of the presentation, and how to make them sizzle, too. What mistakes have you seen presenters make in their openings? Let me know. Also–what do you do to grab their attention and interest in the first two minutes?